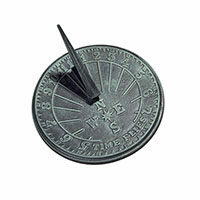 More than just a decorative addition to the garden, sundials are the oldest known instruments for telling time. 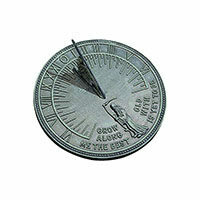 The markings found on the flat surface of a sundial represent each hour of daylight. As the sun moves across the sky from east to west, the gnomon or vertical rod at the center of the dial casts a shadow across this flat surface. The position of the shadow on the hour markings is an indicator of the current time of day. In order to tell time as accurately as possible, a horizontal sundial should be placed on a completely flat surface or on a sundial pedestal with the gnomon facing celestial north (90°N). 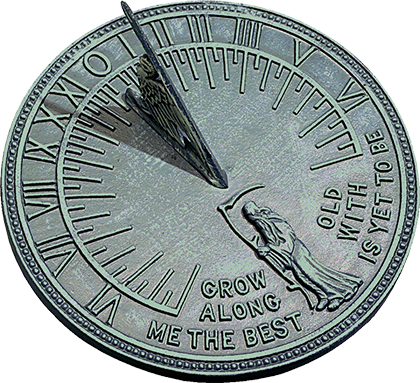 Although garden sundials are a functional time telling piece, many people simply enjoy them as an artistic addition to their garden, along the side of a walkway or as an accent in an outdoor living space. 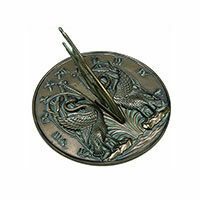 Sundials are typically made out of wood, metal or other materials and often feature intricate designs on their surface. 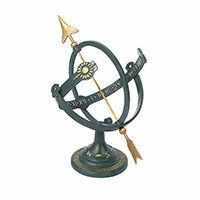 Our sundials are available in brass and cast iron finishes as well as armillary style designs. 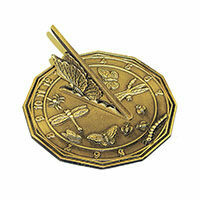 The choice between the type of sundial you place in your garden often comes down to personal preference of the design. 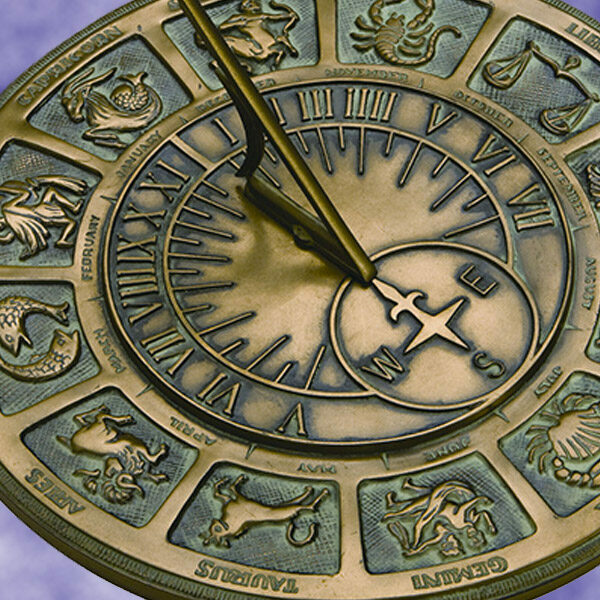 However, horizontal sundials can be easier to position than armillary styles, something which may need to be taken into consideration if you are planning to use your sundial for telling time. 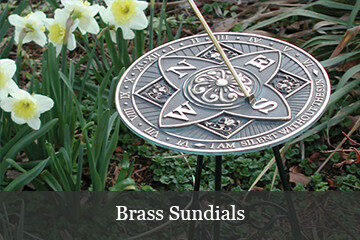 Brass Sundials- Brass Sundials are naturally non-rusting and require no upkeep. Choose from sundials that have a bright brass finish, slight accents of brass, or a two-toned finished with polished brass highlights over a darker patina background. 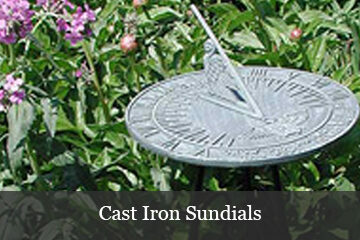 Cast Iron Sundials- Built to stand the test of time and age gracefully through all types of weather, cast iron sundials are an elegant and long lasting addition to a backyard garden or patio. 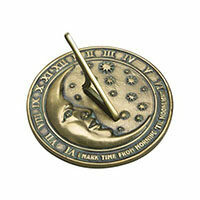 With the world moving quickly around us, sundials offer more than just a way to tell time. They are an artistic addition to our outdoor spaces which bring us closer to nature and history, providing a rare moment of reflection. The choice between a horizontal or armillary sundial is often based on aesthetics and completely dependent on personal design taste. 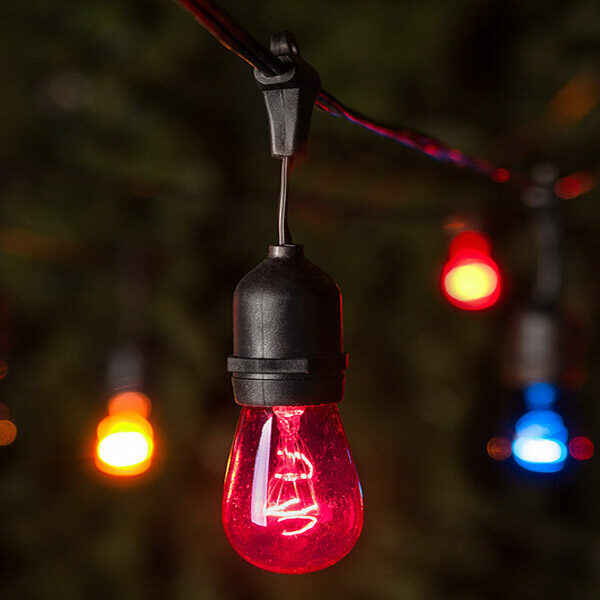 However, there are a few notable distinctions. Horizontal Sundials- As the name suggests, horizontal sundials or sundial plates as they are often called, lay flat across a surface or on top of a pedestal. horizontal sundials are easier to set for telling time than armillary sundials and often include meaningful sayings or inscriptions on their bases which draw the eye in for a closer look. As a result of their inscribed sentiments and meaningful designs, horizontal sundials are often given as gifts and tokens of remembrance. 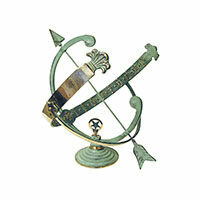 Armillary Sundials- Credit for the invention of armillary sundials or "shadow clocks" as they are sometimes referred to can be attributed to the ancient Greeks. Their armillary globes were models of the universe with earth at its center which displayed how they believed the universe worked and how the stars moved around the Earth. 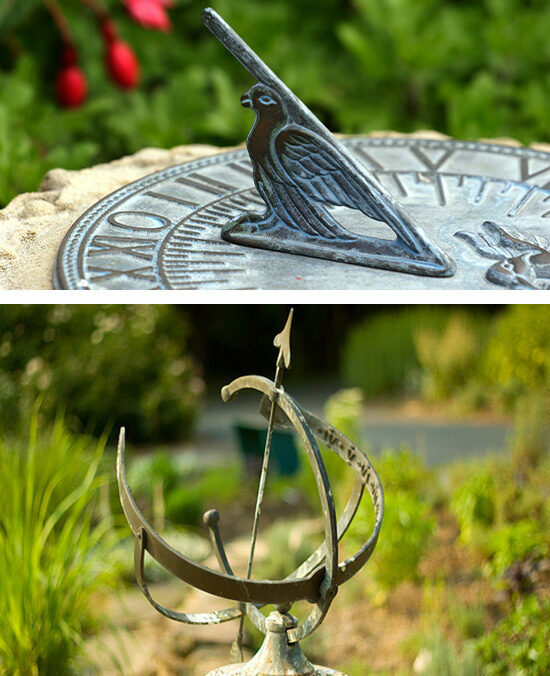 Our armillary sundials are crafted with this ancient design in mind using connecting circles and an arrow shaped gnomon which creates a stunning focal point in a yard or garden. As the sun moves across the sky, shadows fall on the marked surface of the band indicating the current time. 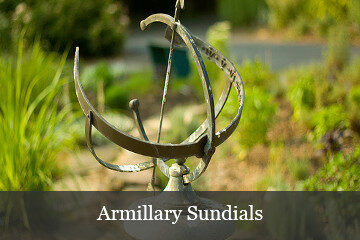 For their striking beauty and resemblance to an artifact out of the ancient world, armillary sundials are often displayed as an eye catching garden centerpiece. 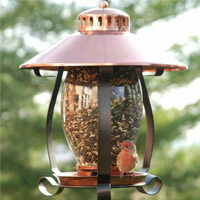 Whichever style you choose, sundials are an elegant conversation piece for any outdoor space.